No charges are expected to be filed against the officers involved in a fatal police shooting in Minneapolis, according to a statement from the county attorney. According to the statement, Thurman Blevins allegedly ignored multiple commands to show his hands, took a gun out of his pocket and turned toward the officers in the June incident. "Mr. Blevins represented a danger to the lives of" the officers, thereby making the shooting "authorized" under state law, Hennepin County attorney Mike Freeman said in a statement. A longer statement put out by the county attorney's office stated that witness testimony, body camera footage and forensic testing proved that Blevins had a gun in his hand. The two officers fired a total of 14 shots, with four hitting Blevins, according to authorities. Protesters interrupted a news conference that Freeman held this morning announcing the decision, according to ABC affiliate KSTP. 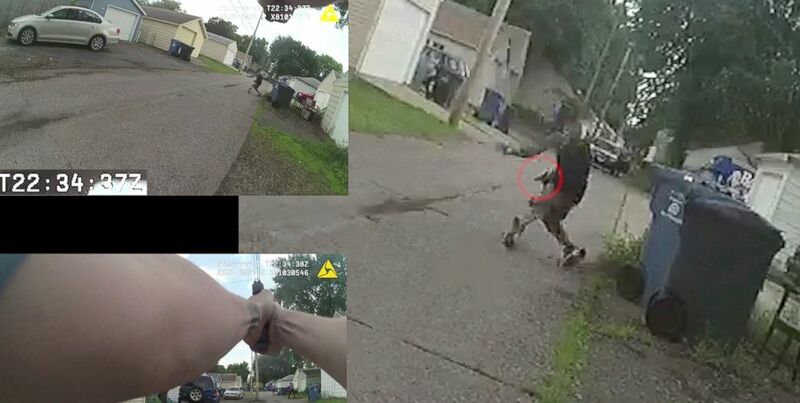 Minneapolis police released multiple videos on Sunday of the frenetic chase that led to the fatal shooting of the 31-year-old man in an alley as he fled from officers. The video shows the chase which lasted only about a minute from when police officers Justin Schmidt and Ryan Kelly pulled up to the scene to when Thurman Blevins was shot and killed in an alley in North Minneapolis. The officers were responding to the area after a 911 call was made saying someone was firing a gun into the air. Bodycam footage from both of the officers shows them pull up to the location and immediately jump out of the vehicle, with one of the officers shouting, "He's got a gun!" Schmidt, who was in the passenger seat, can be heard shouting "Drop the f------ gun!" as Blevins immediately runs from the scene. Schmidt repeatedly shouts for Blevins to stop running and drop the gun while Blevins shouts back "I did nothing, bro" and "Leave me alone." This June 23, 2018, image from multiple police cam videos provided by the Minneapolis Police Department shows a chase between Officers Justin Schmidt and Ryan Kelly and suspect Thurman Blevins, in Minneapolis. The officer shouts "Put your hands up, I will f------ shoot you!" multiple times before he eventually does open fire and strike Blevins. When slowed down, the video shows Blevins pulled out a gun in his waistband just before being shot by both officers, but it is unclear if Blevins fired the weapon. Family members saw the video for the first time on Sunday as well, according to Minneapolis Mayor Jacob Frey. "Regardless of the facts and circumstances that took place on the afternoon of June 23, and regardless of how our own life experiences and backgrounds inform the conclusions we draw, let us all recognize one conclusion: a life was lost and that, in and of itself, is a tragedy," Frey said at a press conference Sunday in which the footage was released. While the body camera footage is now released, this is just one part of an effort to bring greater transparency to these processes. In the weeks and months ahead, we will undoubtedly learn more. In this quest to bring about greater transparency there will be pain." The family, as well as protesters, had been calling for the release of the video since the shooting took place on June 23. Both officers were placed on paid administrative duties during the investigation. The graphic video was made available on the city's website. Sydnee Brown, Blevins' cousin who has served as a spokesperson for the family, continued calls for Kelly and Schmidt to be charged in the shooting after seeing the video. "Officers Ryan Kelly and Justin Schmidt should be fired without pay and prosecuted to the full extent of the law," Brown told Minneapolis ABC affiliate KSTP. Frey took special care to discuss the racial aspect of Blevins, a black man, being shot by two white officers. "I did not experience the pain of inequities that continue to exist in areas well beyond policing and public safety," he said. "But we all need to understand that this pain is felt acutely by people of color. That must be acknowledged." Frey said he has met with Blevins' family and would be willing to do so again. 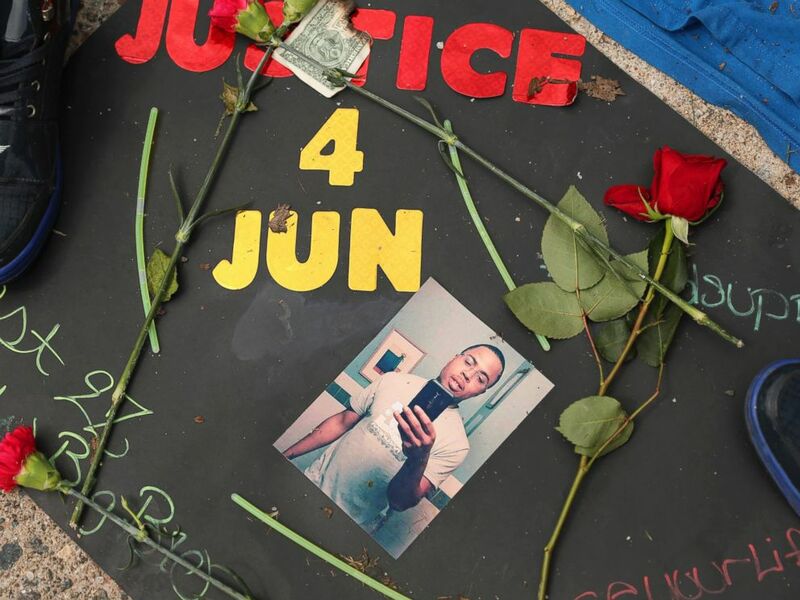 In this June 25, 2018 file photo, a memorial is set up in the alley where Thurman Blevins was killed by a Minneapolis police officer in Minneapolis. Minneapolis Police Department Chief Medaria Arradondo would not comment on the footage as an investigation into the shooting continues. "While Chief Arradondo is currently prohibited by data practice law from commenting on the specifics of this case he will continue to remain engaged, active and listen throughout the community," a statement from the department said. 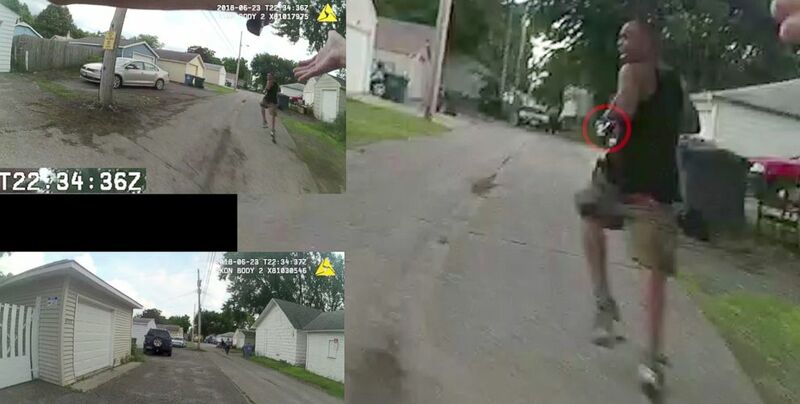 Schmidt's lawyer, Kevin Short, defended his client's actions, saying in a statement to KSTP, "The video shows Thurman Blevins fired one shot at officers. It’s gratifying to know the actions of the officers were justified. Hopefully the public learned a lesson to wait for all the facts and video to come out before vilifying officers." Kelly's lawyer did not comment. The Office of Police Conduct Review, where complaints about officers' behavior can be made and reviewed by an independent party, shows both Schmidt and Kelly have had three complaints lodged against them during their time on the force. They were all closed without discipline, and the reasons for complaints are not made public.